Today was lesson two of the Sandra Vargas Owl with Key Mystery Class. We’ve made lots of progress. 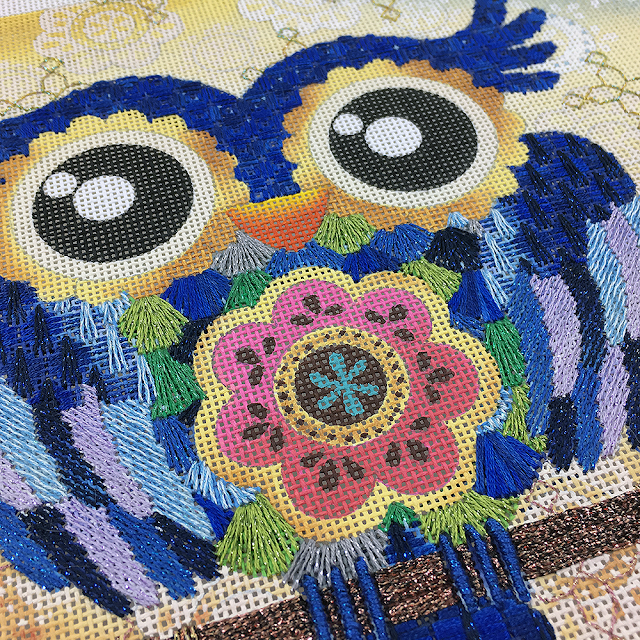 The owl is coming together nicely with all sorts of fun stitches. 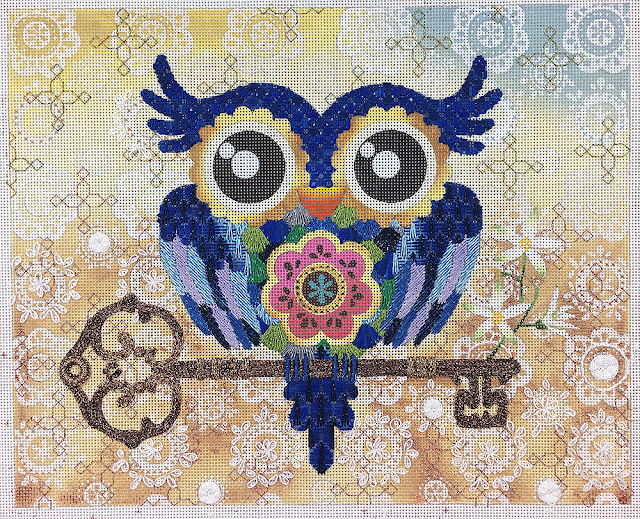 Gloriana provided the perfect shade of blue overdye silk to set the tone for the owl’s feathers. 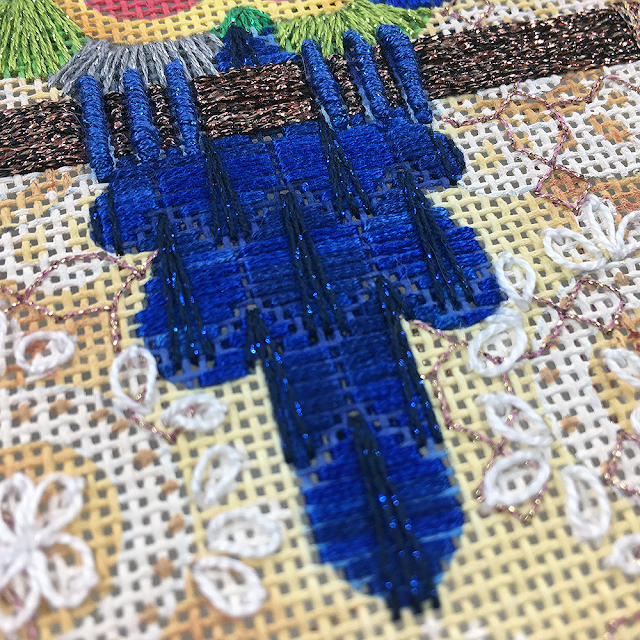 And of course I added Petite Silk Lamé Braid to the piece. You know I love sparkle. 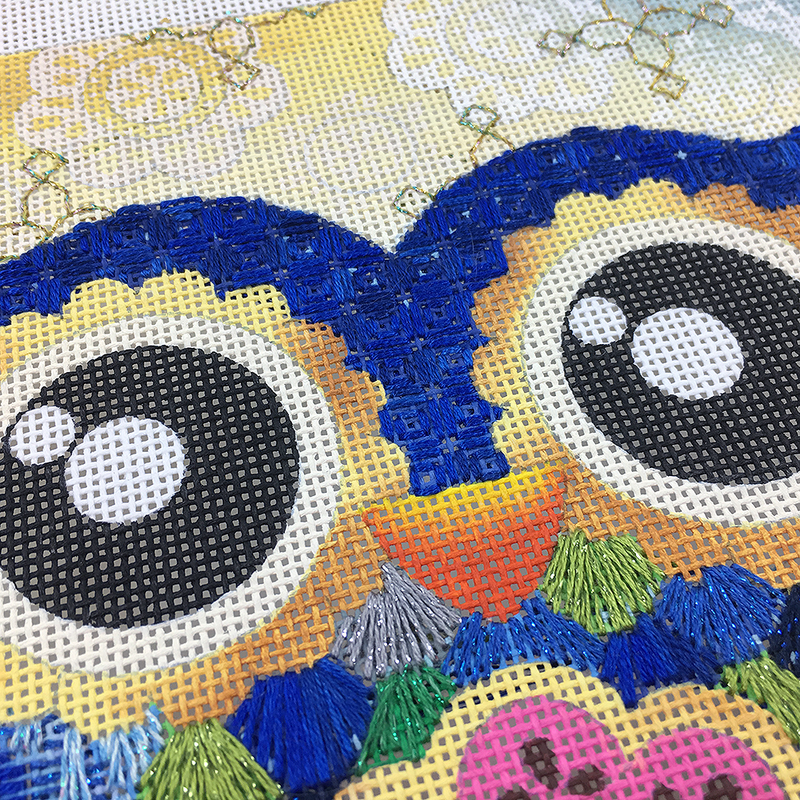 The top of the owl’s head is filled with a tiny pattern stitch that fits nicely in the feathers over his eyes. The upper wing and the tail of the owl both share the same stitch but in two different sizes. Remember stitches can be sized up or down as long as you size even count stitches to even count stitches and odd count to odd count. He’s a pretty cute little guy. The owl was originally planned as a four lesson class but we’re going to change things up and make it three lessons. We’re almost done! The next lesson is July 9th. Can you believe it’s July already. What will be next? We need something happy and sunny. 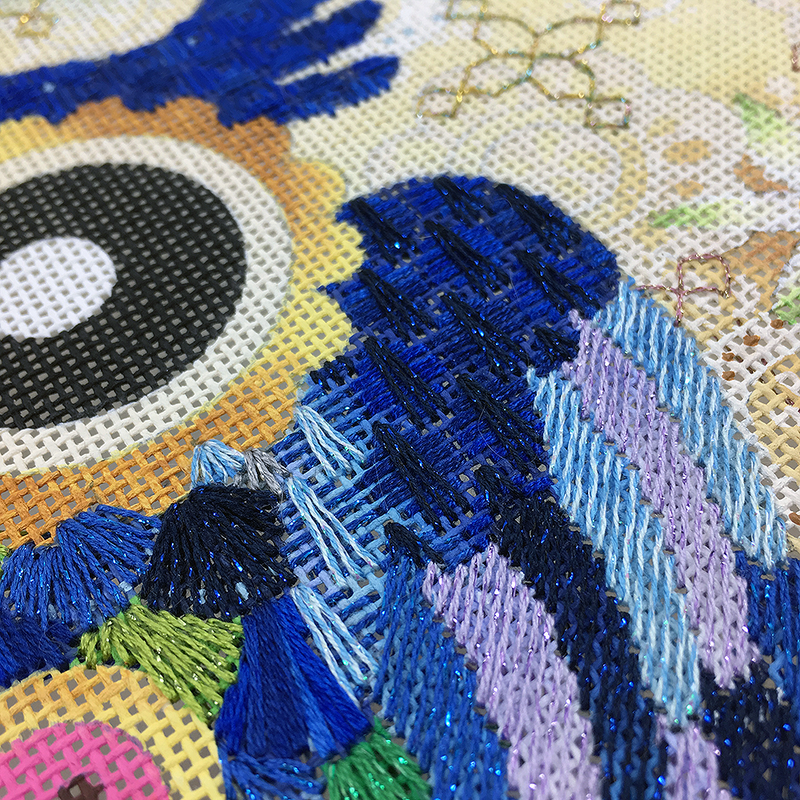 Let’s stitch a bird! 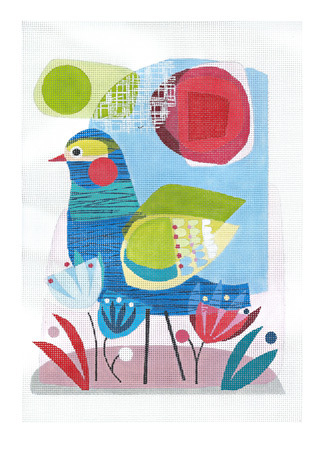 What about a happy blue bird from ellen giggenbach? The design size is 7.25 x 9.5 handpainted on 18ct. Classes will be July 23rd, August 6th and 27th. We’ll keep this one nice and light and airy, perfect for summer. If you would like to join the fun of one of our mysteries you can sign up here, or by giving us a call at 410.296.0405. If you like what you see on the owl, we have canvases in stock and can send you lessons one and two. From that point you will be in the queue to receive the final lesson. Here’s the link to order online. So, where am I with the rest of our mysteries. They are coming along. Row of Ladies will be next. I anticipate that going out by the middle of July. Yes, it’s been a long time but I’m getting caught up. Lesson 5 of Why Fit In has shipped. If you don’t have yours yet, give us a call. We probably need an updated CC. Thank you for your love and support. Happy Stitching.